A beautiful coneflower, producing masses of rose pink to purple flowers with orange/brown centres on tall flower stems to about 1m in height. Flowers appear in July/August to September and this is a wonderful plant for late summer colour, good for the middle of a border or back of a smaller bed. 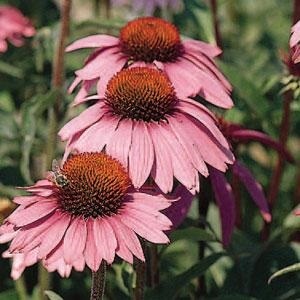 Coneflowers grow well in sun to light shade in a rich well drained soil. Keep well watered during the summer. Pack of approx 200 seeds. Sow anytime. Sowing instructions and a colour photo are printed on the packet. Conditions Sun to light shade and rich well-drained soil. Sow anytime, generally spring to autumn. Sow in moist seed compost and cover lightly with compost or vermiculite. Keep at about 18°C in the light and germination takes 2-3 weeks. Transfer seedlings to pots when they are big enough to handle and then out into the garden after hardening off. Grow Protect young plants from slugs and snails. Once established, these plants are easy to look after. They should flower in the second season, some flowering in the third season. Deadhead during flowering. Plants die back in autumn – clear away the dead material in winter to early spring. Plants grow back in spring.